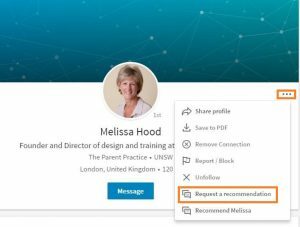 When was the last time you recommended somebody on LinkedIn? How did you feel when you’d written the recommendation? More importantly, how did the person receiving your recommendation feel? And what about you? When was the last time that you received a recommendation? When was the last time you asked for one? When you use a networking site such as LinkedIn, recommendations (and endorsements) are social proof of your expertise and experience. Therefore it makes good business sense to ensure that your profile has recommendations. Isn’t that true for you too? You prefer to work with somebody who has been recommended? It’s important to bear in mind that it’s not just the recommendations you receive … the recommendations that you give also contribute and help build your personal and professional brand. Often when I talk to my clients about recommendations on LinkedIn, they tell me they’ve asked for recommendations in the past but it’s just not worked out. The person they’ve asked has ‘ignored’ their request. When I dig a little deeper, to explore about recommendations that they have been asked to make, typically one of two things comes to surface. a) You get asked to recommend somebody and you are happy to do it but you’re not really sure what to say. So you sit on it for a few days. And then a few more. Before you know it, 6 months has passed. b) The request pops up in your Inbox, on a day when you’re so busy, you can’t even think. You forget about the request. 6 months later, you come across the request in your Inbox. You feel awkward and embarrassed. You don’t know whether to just ignore the request or pretend you didn’t receive it. Sound familiar? If it happens to you, you can be sure that’s what’s happening to the people that you ask for recommendations too. When you ask people for recommendations, make it super easy by being very specific about what you want them to focus on. What do you want to be known for? Is there a specific project you have worked on together? What do you want potential clients or employers to think about you? Do you want to emphasise your project management skills? Your international experience? How you launched an innovative user experience approach? Then when you ask the person to recommend you, be very specific in your request. For example, I asked Beatrix to comment on my LinkedIn Challenge, what she liked about it, how it improved her LinkedIn confidence and the outcomes it had produced for her. I made it very easy for Beatrix to know what to say; hence Beatrix responded really quickly. Where do I go in LinkedIn to request a recommendation? View the profile of the person you would like a recommendation from. On their profile (to the right of the profile photo and underneath their background). Click on … to get a drop down. On the drop down click Request a recommendation. Who would you love a recommendation from? A client you have worked with? A supplier? A work colleague? Send that person a request for a recommendation remembering to make it as easy as possible by being specific about what you want them to focus on. Let me know when you’ve done it! And that’s how to ask for recommendations with confidence on LinkedIn. p.s. if you liked this and you know you’d love even more confidence on LinkedIn, check out my LinkedIn Challenge. Free to enrol so you’ve got nothing to lose. I believe that this approach would work for product feedback as well. Thank you so much for the well-written lesson.